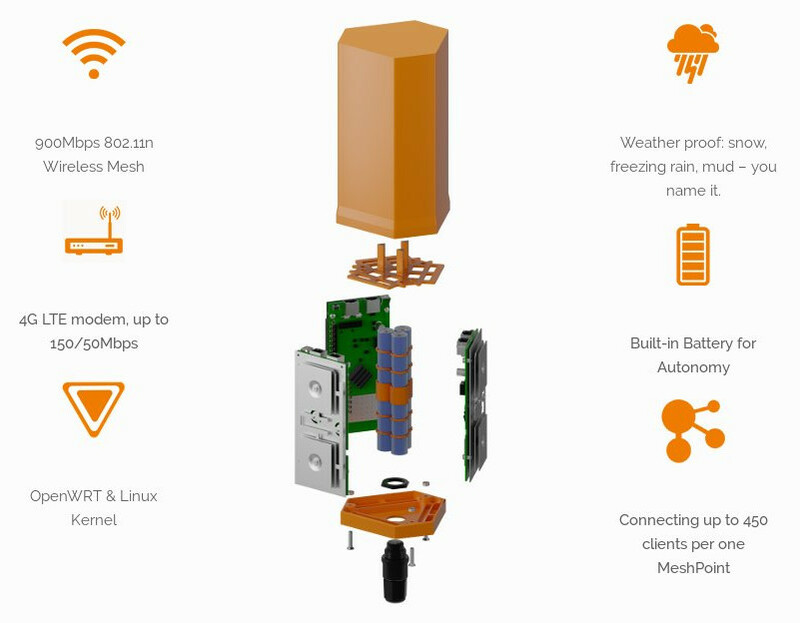 Meshpoint is a Croatian open source hardware company that turns out rugged, meshing, battery-powered wifi hotspots that get their backhaul from cellular networks; they're based on the widely used Open WRT free/open wifi routing software, and use open source hardware designs that are intended to stand up to punishing field conditions like those found in refugee camps. Meshpoint was created by people who lived through the Balkan conflict and keenly remembered the experience of being threatened and displaced by war; when Syrian refugees arrived in their vicinity, the public-spirited hackers behind Meshpoint felt solidarity with their plight and started to create tools to allow refugees to stay in touch with one another and with diasporic populations around the world. Meshpoint has had several trial deployments by different relief agencies and is under continuous revision to further ruggedize the hardware and to smooth out administration by non-expert users.